Novak Djokovic brilliantly dominated a listless Andy Murray to claim his second Australian Open title on Sunday to confirm the arrival of a genuine third force at the top of men's tennis. The 23-year-old bid farewell to the 'one slam wonder' club with a 6-4, 6-2, 6-3 humbling of Murray to join Roger Federer, Rafa Nadal and Lleyton Hewitt as the only multiple Grand Slam winners active in the men's game. Seemingly condemned to being 'the best of rest' behind Nadal and Federer in a golden era, Djokovic's dominant performance suggested he was ready to carve out a chapter in the annals of the game for himself. "I'm living the dream of a tennis player, definitely," he said. "To be able to win in straight sets against a player like Andy Murray in the final of Grand Slam, it makes my success even bigger. "I don't want to stop here ... I'm only 23 and hopefully will have more chances to win Grand Slams. It really gives me a lot of motivation. It's a huge confidence boost." Djokovic's impressive three-set victory over Federer in the semi-finals had set up a first Grand Slam final without the Swiss or Nadal since Djokovic beat Jo-Wilfried Tsonga for his first title here in 2008. There were no tears for Murray as there were here last year when he lost to Federer but the Briton, who had again been hoping to end his country's 75-year wait for a major men's champion, had to admit he had been well beaten. "He played great, I would have liked to have played better," said the 23-year-old, who has now played three Grand Slam finals without winning a set. "But I think he would have beaten every other player on the tour if he played like that tonight. He served well. He didn't make many mistakes from the back of the court. He moved really, really well. He hit the ball very clean. That was it." After the evening cool had brought relief from the first fiercely hot day of the tournament, a close contest between two well-matched players -- born a week apart -- was anticipated on Rod Laver Arena. 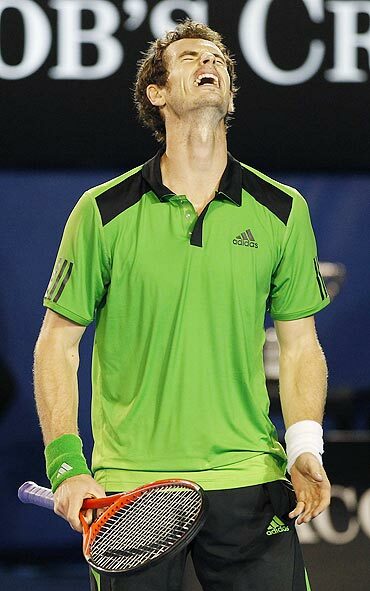 The pressure was etched on Murray's face and he started to struggle with his first serve -- he executed just 44 percent in the opening set -- paying the price with some titanic struggles to prevent the Serb breaking him. The rangy Murray hung in scowling, however, and an intense set looked destined to be decided by a tiebreak until Djokovic edged a 39-shot rally to grab a break point and his remorseless pressure won him the set when his opponent slapped the ball into the net. Murray gestured to his retinue to calm down but if it was supposed to be reassuring, his lethargy and lack of aggression against an on-fire Djokovic was not. 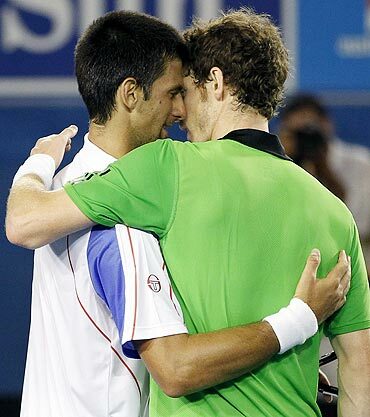 "I had a tough match in the semi," said Murray, who beat David Ferrer over 226 minutes on Friday. "I felt like I could have moved a bit better tonight. And against someone like Novak you need to be firing on all cylinders." Djokovic pounced on a Murray drop shot to take a 2-0 advantage in the second and the fifth seed then simply folded as the rampant Serb raced to a 5-0 lead. A break back restored some dignity to the scoreline but only delayed the inevitable and Djokovic duly summoned up another powerful forehand to take a two-set lead. Murray, who showed only glimpses of his superb shot-making, had said before the match he was going to attack Djokovic's serve and he did get a couple more breaks in the third set but his opponent was now surging with confidence. Djokovic continued to defend like a demon with one running forehand winner at full stretch summing up the difference in skill execution and fighting spirit between the two players. That the Serb's name would be etched on the Norman Brookes trophy for the second time was now beyond doubt and the two-hour 39-minute contest was brought to a close by Murray's 47th unforced error. Djokovic had credited leading Serbia to a first Davis Cup title in December with giving him a big confidence boost and his country was foremost in his thoughts straight after the match. "There has been a tough period for our people in Serbia but we are trying every single day to present our country in the best possible way, so this is for my country Serbia," he said on court.